Facebook has been accused of taking sides in Venezuela’s political crisis, by removing the verification mark from Nicolas Maduro’s Instagram profile and giving it to Juan Guaidó. The unverified claims quickly went viral, as both men claimed the country's presidency. Critics insinuated that Facebook was meddling — backing Guaidó’s claim over that of Maduro. These claims were even repeated by the speaker of Russia’s parliament, the Russian-backed Tass news agency reported. State Duma Speaker Vyacheslav Volodin accused Facebook of bowing to pressure from Washington to recognise Guaidó as Venezuela’s president. “It all is surprising of course when such large social media network that asserts its independence, acts utterly illegally, bending to Washington's will,” he said. But what is really going on here? Let’s break it down. 1. What are verification marks? Blue ticks are used as an indication that a profile is authentic — or “verified” in social media speak. They are added to the accounts of public figures, celebrities, sports stars and politicians. “We want to make sure that people know they are following the authentic presence of a public figure, celebrity or brand on Instagram and Facebook,” Instagram said in a statement to Euronews. 2. What’s the issue in Venezuela? As the row over who was the legitimate president intensified internationally, an image comparing Maduro’s Instagram profile with that of Guaidó went viral. The image shows that only Guaidó's profile carries the blue verification mark. Users were quick to suggest Facebook was meddling. “They just took out Maduro’s blue verification on Facebook and Instagram and gave it to Guaidó!!! !” one user posted on Twitter. So, was Facebook taking sides? It is clearly true that today Maduro’s profile is not verified, while Juan Guaidó’s is. But how did we end up here? Did Facebook really take Maduro’s tick and give it to Guaidó? In a word — no. Using an online tool that curates and archives web-pages, it was possible to view Maduro’s profile as it was in October 2017. The profile clearly does not carry a verification mark at this stage. Facebook confirmed that Maduro had never sought or obtained a verification mark. “Nicolas Maduro was not verified on Instagram or Facebook, and we did not remove verification from his account”, the company said in a statement. 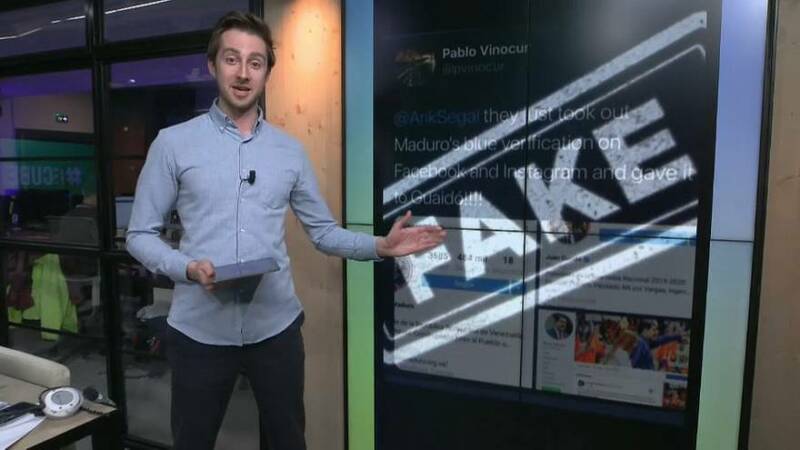 It is therefore not possible for Maduro's tick to have been ‘taken’ and given to his opponent — making the claims circulating online false. The Cube is a newsdesk run by a team of Euronews journalists specialising in social discovery and verification. They comb through social media to find, verify, and debunk stories, in real-time, for our audiences on-air and online.